The Romance Cover: Kahlen Aymes City Contest winner & Kindle Fire Giveaway News! 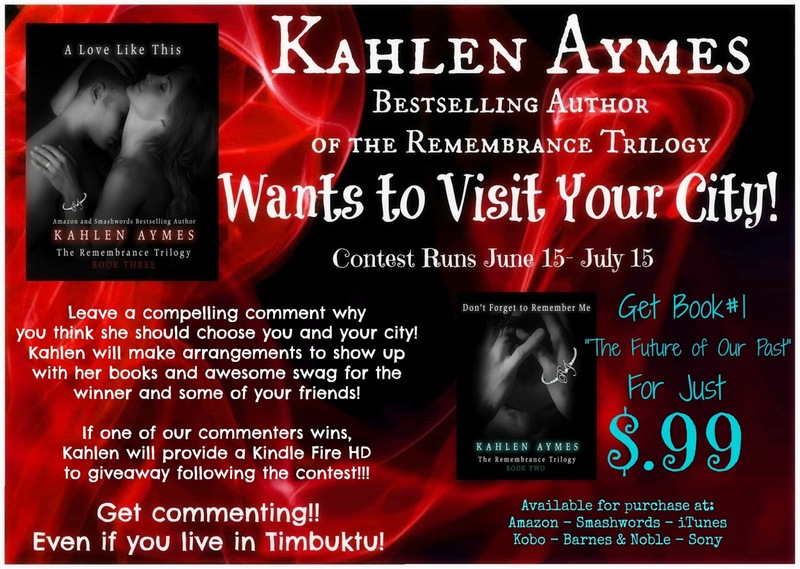 Kahlen Aymes City Contest winner & Kindle Fire Giveaway News! Do you remember Kahlen Aymes' held a City Contest a while ago? All you had to do is post a comment on one of the participating blogs saying why you thought she should visit your city. Each blog then had to pick just one entry to submit to Kahlen, who would then pick one of those as the winner. We would like to say a big congratulations to Erika as she was picked by Kahlen as the winner! Kahlen will be going to meet Erika in January 2014! But that's not all! Part of the contest was that the blog who submitted the winning entry would be given a Kindle Fire to giveaway on their blog! So courtesy of Kahlen Aymes, from September 1st, running for 10 days we will have a giveaway to win a Kindle Fire & a signed set of Kahlen's Remembrance Trilogy! Thank you to Kahlen Aymes for providing The Romance Cover with this amazing giveaway!